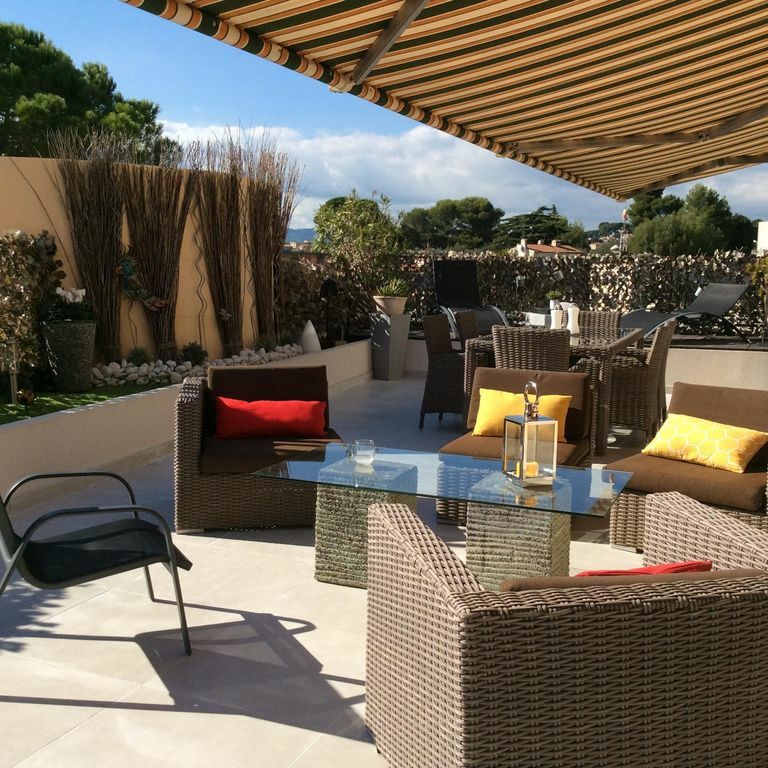 In the Oxford area of Cannes, this adorable luxury roof villa is in a park with many Mediterranean scents, sun from morning to evening, huge terrace with awning, 22x14 m pool with deck, watchman, underground car park, Wi-Fi, residential area, nearby shops and 800 m from rue d’Antibes. Fully renovated 80 m² 3-room apartment with new furniture and 80 m² terrace on the garden level with stunning views of the park and the pool. All exposures, sunny all day long, very quiet, fully fitted kitchen, living space opening onto the 2 terraces, 2 bedrooms with wardrobe, new top-of-the-range bedding, bathroom with window, shower room, 2 toilets, very well heated, underground car park, watchman, pool, renowned luxury residence and hundred-year-old olive trees: the Provence in the city. It is ideal for holidays. Hundred-year-old park, luxury, everything is new, close to everything but without the nuisances, let our holiday-makers enjoy the environment, Résidence de La Begum, Bonnard Museum and path, wonderful 5 km flat path and some good authentic restaurants. The location of the apartment, stunning views, exceptional solarium terrace with full store that is sunny from morning to evening, quietness, all nearby shops and buses accessible on foot. On the terraces: 3-seat sofa, 3 armchairs, 2 deck chairs, bar table and bar chairs. In the living space: 3-seat leather sofa, 2 leather armchairs, dining table and 4 chairs. A true gem of an apartment, immaculately decorated, modern, spacious and very clean, it has everything you could possibly need for a comfortable stay. Great location for exploring Cannes and some beautiful villages nearby. Local shops supply a wide selection of provisions, it's possible to buy everything you need within a 15min walk or short drive. The roof terrace made our holiday, plenty of space for the four of us, plus both bedrooms has terrace space and there is a wonderful small terrace off the lounge which captures the morning sun, overlooking the pool and pretty gardens. My family spent the most wonderful two weeks in this apartment. It is well situated with beautiful garden and pool. The apartment is very modern and very well equipped with a stunning terrace. It is really a 5 star accommodation. We recommend this apartment and we are looking forward to our next visit. Pierre, thank you ver much for having us. Your apartment is a true gem. Spacious, bright, calm, very tasteful decorated and fully equipped with everything you could need. We enjoyed our stay to the fullest! Merci beaucoup! Chers Annett , merci d’avoir séjourné chez nous , c’est notre résidence principale et cela fait toute la différence ... et la californie quartier résidentiel de CANNES c’ est le trottoir en face . Sehr liebevoll eingerichtete Wohnung mit umfangreicher, hochwertiger Ausstattung, traumhafter Terrasse und großem Pool im wunderschönen Park der Wohnanlage. Tolle Lage, sehr sauber, freundlicher Empfang und gute Betreuung vor Ort. Einkaufsmöglichkeiten, Restaurants und Bars im Ortskern nur wenige Minuten entfernt die Straße hinauf. Direkte Busverbindung zur Croisette mit stündlich verkehrenden Bussen. Alles war super, eine sehr schöne Wohnung. Die Terrasse ein Hammer, wir haben noch nie eine so riesige und liebevoll eingerichtete Terrasse erlebt. Kleiner Ratschlag: gehen Sie zum Essen nicht nach Cannes, sondern in den Ortskern von Le Cannet-15 min zu Fuß. Dort gibt es mehrere sehr gute Restaurants. Must-see close to the apartment: the old village of Mougins, the village of Le Vieux-Cannet, Espace Bonnard in Le Cannet, Saint-Paul-de-Vence and its galleries next to Nice, Gourdon on the hills of Grasse and Grasse with its perfume museums.